THE ENGAGEMENT SESSION a style guide. 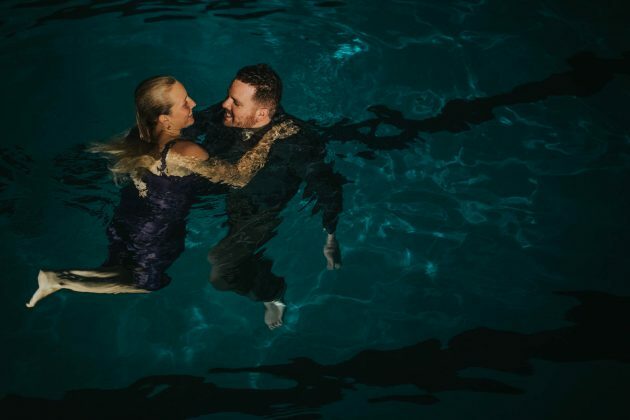 Engagement Sessions are all about celebrating your love story, showcasing who you are as a couple, embracing your personalities and offering a little glimpse into what your lives are like. It's all about capturing who you are, as a couple. It’s going to be laid back. I want you to get comfortable and used to being in front of the camera, together. We will do a LOT of talking and walking around. I’ll tell some terrible jokes, give you a little direction and by the end of the session you guys will be pros. It’s going to be a good time. We are going to explore, try out some creative ideas, and get to know each other. We can incorporate your pets, your hobbies, and activities you two do together. We can make it fun and exciting. It’s going to be real. These won’t be your grandmas photos- a whole evening of you two standing still and fake smiling at the camera until your faces hurt. I want to give you images that feel authentic. That show real moments, real emotion, interaction and capture who you are as a couple. It’s going to make THE biggest difference. On your wedding day we can bypass the whole “getting to know each other + getting comfortable in front of the camera part” and jump right into the REALLY good stuff. The authentic moments that really show who you are. The creative photos that no one else is going to have anything like. The stuff you can show off to your friends and hang on your wall as art. picking a date and time of year. If you are planning on using your images for Save-The-Dates, I recommend you book at least 5-6 months out from your wedding day. It takes me 4-6 weeks to edit and send over the images from your session so that will give you time to get the photos back, order save-the-dates and then get them mailed out. My weekends tend to book up quickly with weddings. If you can only do an engagement session on a weekend date, I book those 3-4 months in advance. If you can make a weekday evening or morning work then I can book those almost anytime and I have a lot more flexibility. WHAT HAPPENS IF THE WEATHER IS HORRIBLE ON THE DAY OF OUR SESSION: I will be in contact with you leading up to the date we have on the calendar and will be monitoring the weather during that time. If the weather isn’t cooperating for an outdoor session, we can either find an alternate location with indoor options or reschedule to the next available date we both have open. If you have your heart set on a sunset session outdoors during “golden hour” we will keep rescheduling in order to make that happen. On your wedding day we aren’t going to have control over the weather and will just work with what we have, so I’d rather give you the exact conditions you are looking for, for your engagement session when we have more control over it since we can always reschedule and try for a different evening. setting the mood of your session. Picking a location can be the hardest part of preparing for your engagement session. Sometimes it’s beneficial to start off by thinking of locations that have some sort of meaning to you. Maybe you got engaged there, had your first kiss there, etc. Next, try thinking about ways in which you spend time together. Maybe you are both adventurous hikers or foodies who love being downtown. Maybe you spend countless hours of your free time together at coffee shops or you spend all summer camping in the woods- canoeing and hiking. Maybe you love just spending time at home together. 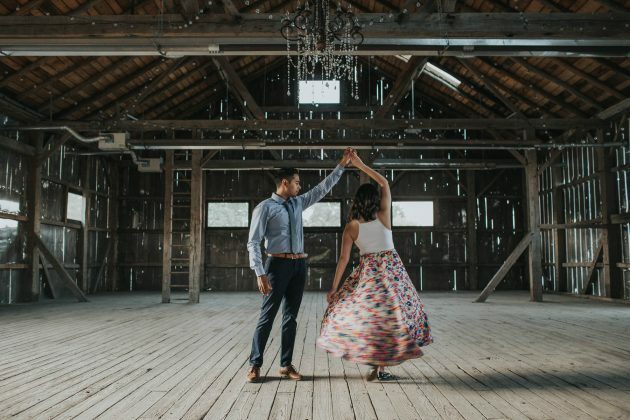 Let’s incorporate some of that into your engagement session! Please be aware that some places require me to have a permit to shoot professional photos at (Greenhouses, Indy Parks, etc.) A lot of the time that costs an additional fee which you will be responsible for covering (I’ll let you know what that is when we discuss location ideas etc.) and I will typically have to apply for it in advance. Most of the locations that require a permit have a set time frame we can be there for and little-to-no flexibility on changing the date in the case of inclement weather. We can discuss all of that in more detail if your location does require a permit. TIME OF DAY At the engagement session I want to make sure we have the best, most flattering lighting. In general, I either schedule engagement sessions in the evening leading up to and ending around sunset or starting around sunrise and ending a few hours later. LOCATION SUGGESTIONS If you have an idea of the general vibe (urban, nature-y, a tall field, a rooftop with a view of the city, etc.) you have in mind but not a specific location, I can total help to offer suggestions of places that meet that vibe. I’m MORE than happy to help you plan the perfect engagement shoot. It’s the perfect time to buy that crocheted lace jumpsuit from Free People that you’ve been eyeing + to rock that deep crimson lipstick that makes you feel like a million bucks. Get all dolled up with hair and makeup beforehand if you want. I want you to feel absolutely stunning. It will come across in your photos- that feeling, that confidence. And that’s what we’re aiming for. Outfit Changes: For the first outfit, start off with something a little more casual, something that looks like you on a normal day but maybe a little more styled and dressed up. It should be something you can move around in, sit on the ground in, and are comfortable wearing. Work your way up to the really dressy looks. If you are having a sunset session you want your dressiest outfit to be for the sunset part (or first if you are doing a sunrise shoot.) If it fits your aesthetic, something long and flow-y for the sunset/sunrise portion of the day will allow us to get some really stunning images. Mix and Match Prints, Textures, Layers + Unique Pieces: Incorporate a mix of patterns or prints – put him in a plaid shirt that pairs well with your striped skirt. Find pieces that have texture- lace, embroidery, etc. Layer on a vintage jacket over an evening gown, plum tights under your high-waited shorts, or any item that really shows off your style and personality. Textures, prints and layers will add depth to your photos. Color: Unless you are going for an ultra sleek + mod all-black or all-white look, pair colors that work well together. Colors that are complimentary to each other and to your skin tone, hair + eye color. I tend to suggest a more neutral palette (creams, whites, blacks, browns, tans. etc) muted colors, darker prints and patterns mixed in with pops of bright color. Accessorize It Up: Think of accessories as the icing on the cake -the final bit that pulls everything all together and the part that takes your look to the next level. Add pops of color, texture and depth to your look with a statement necklace or a floppy fedora hat. Keep Your Location In Mind: Pick your clothing colors intentionally. 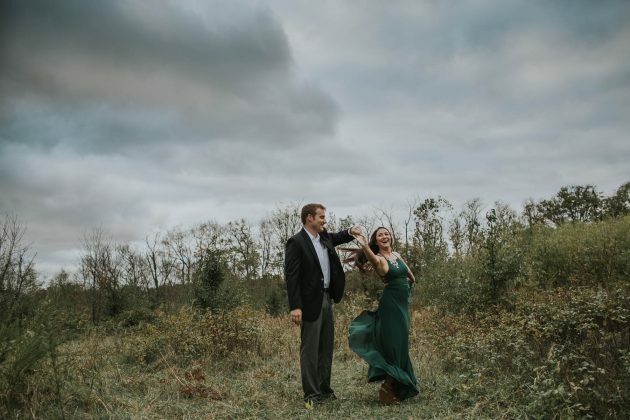 If your session is taking place in a green grassy field, you might want to pick colors that pair well with green and skip wearing a green dress during this part (unless you want a monochromatic feel to your images which can be super awesome too.) If we are starting off in a tall field that may have prickly foliage, you may want to reconsider wearing shorts for that part of the shoot. Shoes: If you are just dying to incorporate your new platform wedges, or sky-high heels make sure you bring along some comfier shoes for walking around in. My engagement shoots tend to incorporate a LOT of walking around and moving around in general for photos. I just don’t want you to be super uncomfortable the entire time. Hair + Makeup: The perfect time to try out a trial run of your wedding hair or makeup is your engagement session. You can actually see how it’s going to photograph and get to know your hair stylist and/or makeup artist as well. Getting your hair and makeup done before the shoot will make you feel fabulous. If your shoot is outdoors, make sure we have a backup location in mind or that your hair/makeup appointment is flexible in case we need to reschedule due to weather. What To Avoid: As a rule of thumb, avoid shirts with logos, being too “matchy-matchy” with your outfits (unless you are rocking an all black or all white look,) choosing clothing items with super bright neon colors, and carrying around a bunch of stuff during your shoot. I’m more than happy to carry around your keys or cell phones but try to leave anything larger than that at home. For Inspiration: I’ve compiled a Pinterest board of outfits that are aesthetically pleasing, can give you some inspiration and which you can view, here. I want to create photos that are super unique and personalized to you. That tell your story and show a glimpse into your lives. Photos that live and breathe authenticity. You know the guitar you play every evening when you get home from work, that vintage car you lovingly restored, the living room you painstakingly remodeled and redecorated, the dog that is basically like your child – those things you pour heart and soul into. Let’s incorporate those. Let’s do some really unique things- explore a waterfall, or build a giant bonfire in your backyard and roast some s’mores because that’s what you two do every autumn. Or we can pitch a tent in the woods and take some creative photos because you guys love camping. I want to make some art that’s unique. Let’s make this engagement session an adventure. A NOTE ON INCLUDING PETS Yes, yes yes let’s include them! It tends to work best if we incorporate them for part of the session instead of the whole thing, so maybe have someone come along to occupy them when we don’t need them for photos anymore. Or have someone drop them off for part of the shoot etc. We could also start at your house and go somewhere else for the second half, so they can be included. I’m the BIGGEST animal lover and if there’s ever a question of “can I bring my dog/cat/hamster for photos,” the answer is always YES! THESE ARE BY NO MEANS RULES YOU HAVE TO FOLLOW (break ’em all if you wanna) At the end of the day, the engagement session can be whatever you want it to be. The most important thing is that confidence is key and I’m going to be here to have your back and make you feel comfortable. I will guide you as much as I need to during the shoot so we can get the real’ good stuff. No matter what you decide to wear, or where we go for the shoot, we’ve got this. It’s going to be amazing.